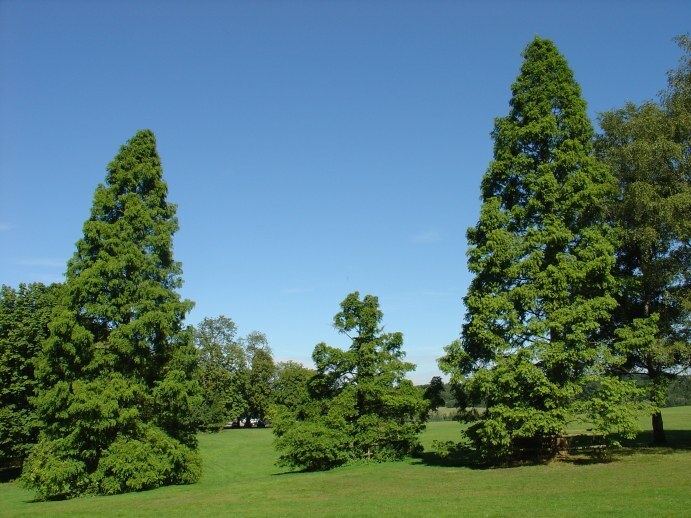 Tucked over the far side of the fields at Weald Country Park are these three Giant Redwoods. A herd of cows can be found munching serenely among these giants in the Summer, although fortunately they don't find the trees' foliage at all appetising! 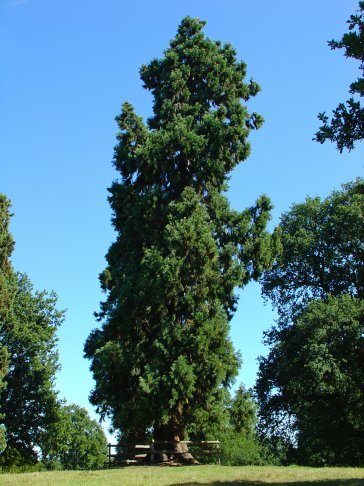 Near the Visitor Center off Lincolns lane, there is also a group of three Dawn Redwood (Metasequoia glyptostroboides). Two look to be in excellent condition, but one poor straggler looks decidedly stunted, being very short and quite untidy in shape. 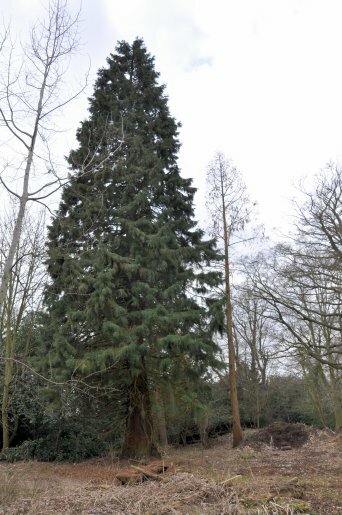 A further two Giant Redwoods can be found via the Sandpit Lane entrance, nestled amongst other trees. 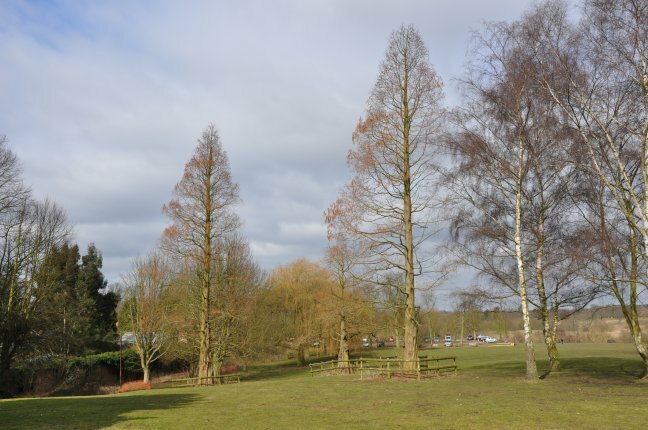 Weald Country Park was once a deer park, used for hunting by the Abbots of Waltham around 1063. These were re-introduced in 1987, the deer that is, not the Abbots... 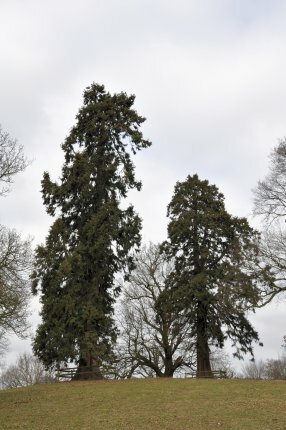 It has also been the site of a hall and gardens, but is now 550 acres of mixed woodlandand grassland, with two lakes that were created in the 18th Century by damming a small tributary of Weald brook. On a return visit in 2010 the Dawn Redwoods are just starting to produce this year's buds, all are in fine health; even the "straggler". The Giant Redwoods are now cow-free and the fence around them has been removed, although they all still have their individual guards. 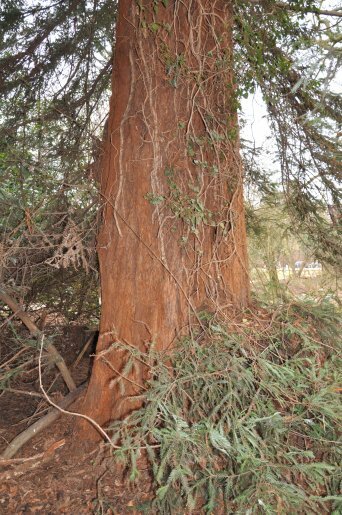 On this visit, a trio of Redwoods were also discovered. They are tucked away in a part of the park that is currently being used as a bit of a dumping ground. It is a shame as this could be made into a picturesque feature that would show the Giant, Coast and Dawn to their best advantage. 7 & 8 via Sandpit Lane entrance Girth was measured at 1.5m from ground.